I am going to list a few facts about David Ortiz. - He came up to the Major Leagues in 1997. - Between 1997 and 2002 he was an adequate yet oft injured part time DH/1B for the Minnesota Twins. 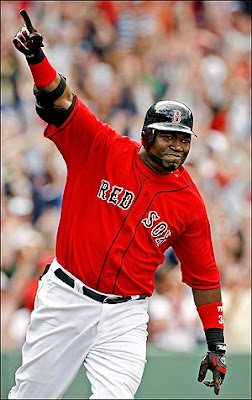 - In 2002, his sixth season, a 26 year old David Ortiz set a new career high with 20 homers as the Twins made the ALCS. - After the 2002 season, the Twins declined to offer him a contract. - He signed with Boston in 2003 and struggled at the plate, batting .208 with 1 homer and an OPS of .657 on May 13. - Suddenly, the oft injured and struggling hitter exploded with numbers that dwarfed his best seasons in Minnesota. His previous career high in home runs was 20. He hit 31 in 2003. His previous career high in RBI was 75. He drove in 101 in 2003. His previous high in OPS was .839. His OPS in 2003 was .961. And he reached all of those new highs in only 3 more games than his previous season. - He exploded into one of the most dominating offensive forces over the next four seasons. - His physique was terrifying. - The era was best described by Alex Rodriguez as "Loosey Goosey." - Steroid use can lead to heart issues. - Ortiz developed heart problems in 2006. - His injuries increased and his bat speed decreased when testing became more frequent in the wake of the Mitchell Report. - In 2009 he has as many home runs as Dr. Maya Angelou. - He was great friends with Manny Ramirez. - Manny Ramirez is serving a suspension for testing positive for a banned substance that is commonly used to help people coming off of a steroid cycle. All I've done is list some facts. I am not accusing anyone of anything. I love David Ortiz and the wonderful memories he has given all of us Red Sox fans. Just have your guard up. Those are some interesting facts in cronological order. One could easily think there is a connection to steroids. just about every big name statistic guy has already been named. You may have a point Sully. Even as a Yankee fan, I like Ortiz and I'm hoping that your statements are wrong. Add me as a Yankee fan who hope he never used and does not have severe Health Problems. Yup. Sad to say it, but "he lika da juice". Hmm, average Pirates starter with 93 mph fastball and arm trouble, comes to the Giants and the Bay Area of BALCO fame, all of a sudden throwing 99, no arm trouble, perennial Cy Young candidate, with facial acne. Then, testing began... and Jason Schmidt hasn't pitched in two years, even though he's still technically on IR. These "do the math" ones have to be acknowledged, even if it's painful. As a Twins fan, after hearing all of the talk about how stupid they were to let Ortiz go, I am happy about this. We knew he wasn't as good as the numbers he was putting up in Boston. You are now seeing the no-defense, no-run, swinging wildly Ortiz we remember. Wow, what are the winning powerball numbers for this weekends drawing? Seriously, I knew it couldn't all be hotdogs and donuts doing it for Ortiz but why oh why did we have to find out? Oh yeah... like YOU predicted it! I guess Jake Peavy knew something that we didn't! Is it possible to grind your teeth to the gums? Rangers - Tigers... is this a playoff preview? Wait a second... The Rangers are in first place? Now THAT is a teeth grinder! THAT'S MORE LIKE IT, A'S!!!! Put another on the Dodged A Bullet Board! What team will NOT hire Chris Chambliss next? Wait... Carl Pavano beat us? Did Zack Greinke do it again? How can a game end on a bases loaded walk?